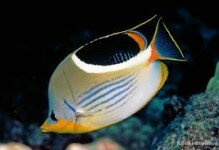 The Pebbled Butterfly is not a very colorful fish compared to most Butterfly Fishes. 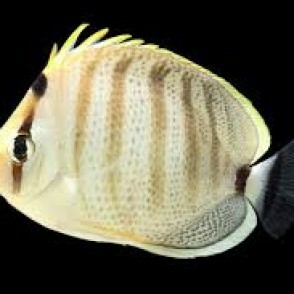 Its body is a white, creamy color marked with five or six tan vertical bands, one of which is black or darker brown that runs through the eye. 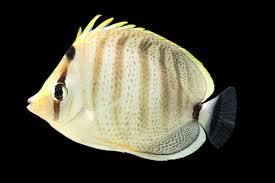 The body is also covered with many small spots, some organized in horizontal and vertical rows. 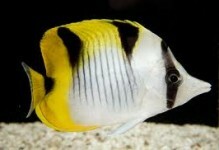 Its eye is yellow in color and the tip of the caudal fin is marked with a black band. The base of the tail also has a reddish/rust colored band. 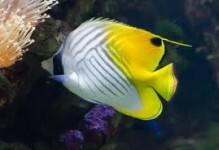 It is one of the Butterfly Fishes that is less sensitive compared to most other fish in the Butterfly Fish Family and even though it is not very colorful, it makes a nice addition to an aquarium. 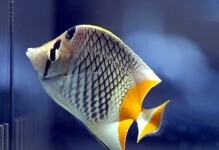 It is a fish that beginning level aquarists can care for once your biological cycle has been established and your tank is settled in.